This week my course on the history of the Canadian West since 1885 kicked off with a look at the trial of Louis Riel. This November 16th will mark the 125th anniversary of his execution as the first and only person to be tried and convicted for high treason in Canada. On Thursday, our class will be discussing Chester Brown’s comic-strip biography Louis Riel. The purpose of the discussion will be to evaluate this representation of Riel’s life and how a comic-book format shapes the narrative. This got me thinking about the various ways that Riel has been represented in other media, including sculpture, television, and even film. Since I didn’t have time to fit this into my lecture on Tuesday, I thought I would post a few such representations of Louis Riel here. 1971 statue by Marcien Lemay and Etienne Gaboury. 1996 statue by Miguel Joyal. The controversy over the Louis Riel statue at the Manitoba legislature in Winnipeg is well-known. In 1971, Marcien Lemay and Etienne Gaboury unveiled their abstract representation of a naked and twisted Riel surrounded by walls emblazoned with text from Riel’s own political writing. By the 1990s, the statue had become such a source of controversy that the provincial government decided to relocate it and replace it with a new statue. 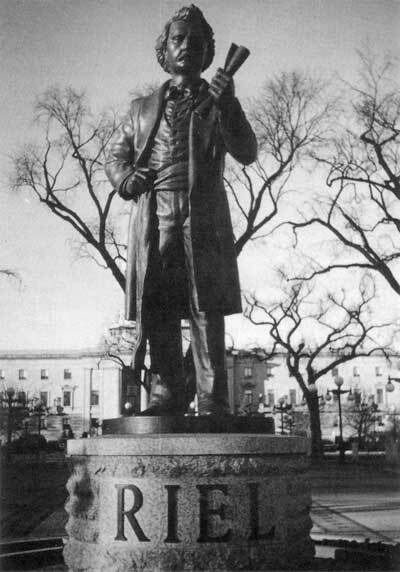 You can read Shanon Bower’s excellent article in Manitoba History for more details on the two statues of Louis Riel. Do you remember this Historica Minute? “Louis Riel” was certainly one of the most powerful Historica Minutes ever produced in a series that has received much deserved criticism. This one, however, I think was particularly good (and definitely controversial at the time it was first aired).